IN A major boost to its oil exploration bid, ONGC (Oil and Natural Gas Corporation) has made reserve accretion of 10 million metric tonnes (MMT) of oil in the state. The area of the discovery falls in Jorhat district and two wells, one each at Sufayam and Dayalpur, have already been drilled to exploit this 10 MMT reserve. This is one of the biggest discoveries by the state-run oil explorer in Assam after a gap of three years. 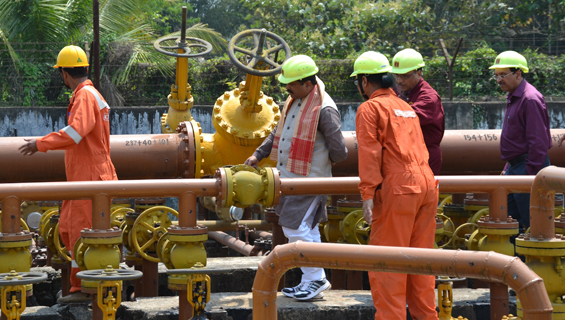 around 50 tonnes of oil daily, thus taking the total daily production of Jorhat asset from 350 tonnes to 400 tonnes. “We are now putting enhanced focus on production besides continuing with our exploration activities. As soon as we make onshore discoveries of oil or gas, our target is to soon start production from them. First time in three years we have made reserve accretion in Assam of 10 MMT. Within two months’ time we created facilities and put these two fields into production,” said Ved Prakash Mahawar, director (onshore) of ONGC. Mahawar said ONGC would achieve the target set for the production in Assam in the year 2016-17. The target of production for 2016-17 for Assam asset and Jorhat asset collectively is 0.96 MMT. “We will achieve 100 per cent target this year. Till now 98 per cent target achieved,” Mahawar added. He said the Maharatna PSU wishes to re-enter Nagaland and exploit the discovered reserves there. ONGC, he said, would however, like to work out on modalities with the Nagaland government as how to go ahead, whether solo or in partnership with the state government etc., before entering the state again. “We have already let known the ministry (union ministry of petroleum and natural gas) that Nagaland has substantial reserves and it rests on the ministry how it puts those reserves into production mode,” he said. The company was present in the state till 1994 when it quit in the wake of violent militant activities. Earlier, in its 290th Board Meeting held on February 23, ONGC Board approved development of five projects with an aggregate investment of Rs.7327 crore which will lead to production of 14.969 MMT of oil and 2.972 BCM of gas. ONGC has so far notified as many as 18 discoveries in FY-17. ONGC under the Ministry of Natural Gas and Petroleum is the largest producer of crude oil and natural gas in India, contributing around 70 per cent of Indian domestic production. The crude oil is the raw material used by downstream companies like IOC, BPCL, HPCL to produce petroleum products like petrol, diesel, kerosene, naphtha, cooking gas-LPG.